What's your favorite Easter candy? Mine are the classic hollow chocolate bunnies. There is something so wrong, but satisfying about biting into their sweet little ears. Is it the nostalgia or the pure sweet chocolate? As a mother, I've been planning our Easter for the last couple of weeks and have been preoccupied with the candy I want to eat. It dawned on me that I've never seen a bunny cookie dipped in chocolate, but why? The combination is amazing! Part chocolate, part baked cookie - perfection. These are so easy to make and will look gorgeous on your holiday table. What do you need? In a small pot, bring 4 oz. of heavy cream to a simmer over medium heat. Once at simmer, immediately pour into a bowl. Add the 4 oz. of hot chocolate to the cream and immediately place lid on the bowl. Set aside for 15 minutes - the contained heat of the cream will start to melt the chocolate. Remove lid and stir the ganache until nice and smooth. Once the ganache has cooled a bit, place into a piping bag. 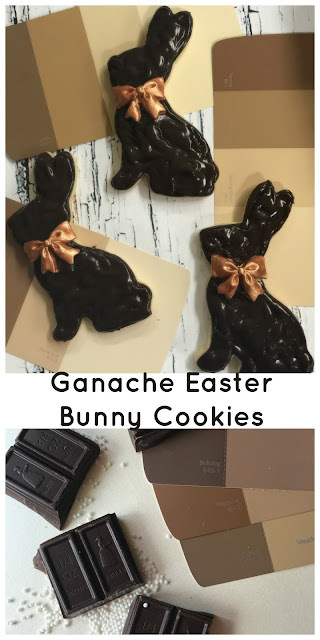 Carefully outline and fill the bunny cookie with the delicious chocolate icing. Ganache will take a while to set up, so be careful while they dry. I have a minute video below that walks you through the steps. Push fondant into the silicone mold. Place in the freezer for about 10 minutes to allow it to harden. Pop out of mold and paint with the metallic food dye. Carefully place bow on the chocolate bunny. Aren't these beautiful? These would be gorgeous on your finest china for Easter brunch and a delightful favor for your family! Easy and delicious - the perfect way to celebrate.